After noticing an injustice that she knew very well, one day a lady decided to take a stand. In a single moment, she made a decision. When asked to get up out of her seat so that someone percieved as more important could sit, she refused. Like dominoes the whole world changed as a result, and is continuing to change. One single act of defiance against evil. Our stands of righteousness might not seem to measure up with hers, in regard to our fame and the effects that we see, it may seem kinda extreme… but in the spiritual realm, it may be even more impactful. And who knows when the levys will break again in the natural. 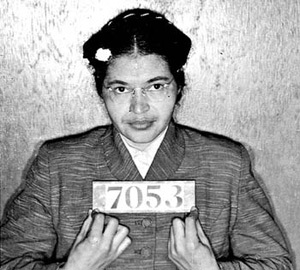 By the way, I was refering to Rosa Parks.